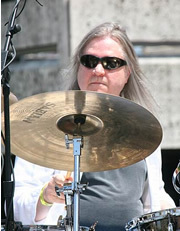 Michael took on the daunting task of drumming for the Magic Band reunion tours when Robert Williams was unable to carry on playing with them. This allowed John French to take on vocal duties. Michael’s introduction to the band came from Mark Boston. The two of them had played together for many years in a band called Duck which toured US military bases around the world. He’s also played with country singer Leon Everette (as did Mark) and Denny King (another famous Lancaster musician). Michael had auditioned for the drum slot in the Magic Band in 1976 after having met Don but wasn’t able to take it on due to other commitments. Read the Radar Station’s interview with Michael. As well as touring with different bands Michael now also runs a successful studio – Synaxis Sound – in Tallahassee, Florida. Since Michael stopped touring with the Magic Band he has been pretty busy producing albums for Drew Tillman and Caleb Mcleod as well playing drums on a lengthy tour with Tommy Tutone. Michael produced and engineered this album from the Florida singer who plays his own alt-country/Americana compositions. Michael plays drums and contributes backing vocals alongside Mark Boston on bass on this great blues album that also includes a cover of ‘Sure Nuff N Yes I Do’. The album was produced by Michael at his Synaxis Sound studio in Tallahassee. Rhonda Hanson is a gritty-voiced singer songwriter writing material based on her Christian faith. Michael produced and engineered this album at Synaxis, as well as playing drums and percussion, and contributing backing vocals. Michael engineered this album, as well as playing drums and percussion, and contributing backing vocals. Michael produced and engineered this album, as well as playing drums and percussion, and contributing backing vocals. A a progressive heavy keyboard band. The album was recorded in Atlanta, Georgia. This was the band that also featured Mark Boston at one time. Myth was a straight ahead rock band based in Tallahassee Florida. The album was recorded at Woodland Studios in Nashville Tennessee. Michael wrote some of the material, sang and played drums and percussion.